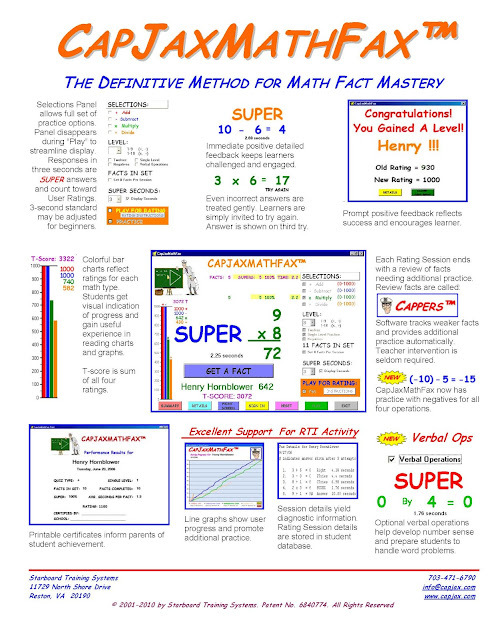 CapJaxMathFax™ system has controls that allow small-step goal-setting so progress is evident and guaranteed. Uses a computer to provide drill and practice so that practice time is not limited by teacher availability. Automatically generates exercises. Teachers don't prepare quizzes. They merely provide the parameters for them. Builds exercises for any of the four math tables (addition, subtraction, multiplication, division) or any combination of tables. Can focus practice at a single level of difficulty or may review earlier levels. Randomly generates problems without repetition. Allows variable numbers of problems in an exercise. Reduces learner stress by timing facts individually. Provides immediate positive feedback for correct answers. Provides extra reinforcement for fast, correct answers. Displays an overall performance report at the conclusion of each exercise. Prints reports for teacher review and for use as certificates of achievement. Displays and prints item diagnostic details. Charts student rating progress graphically. Maintains a database of student activity over time. Starboard Training Systems is headed by Jack Fretwell. Mr. Fretwell earned a Masters degree in Educational Technology and has spent over thirty years in education and computers. With Mr. Fretwell heading up CapJaxMathFax™ for the last 10 years, we have seen many children develop stronger math skills and confidence. Starboard Training Systems’ goal is to help organizations that teach, train and mentor our children so that not one is without basic math abilities. 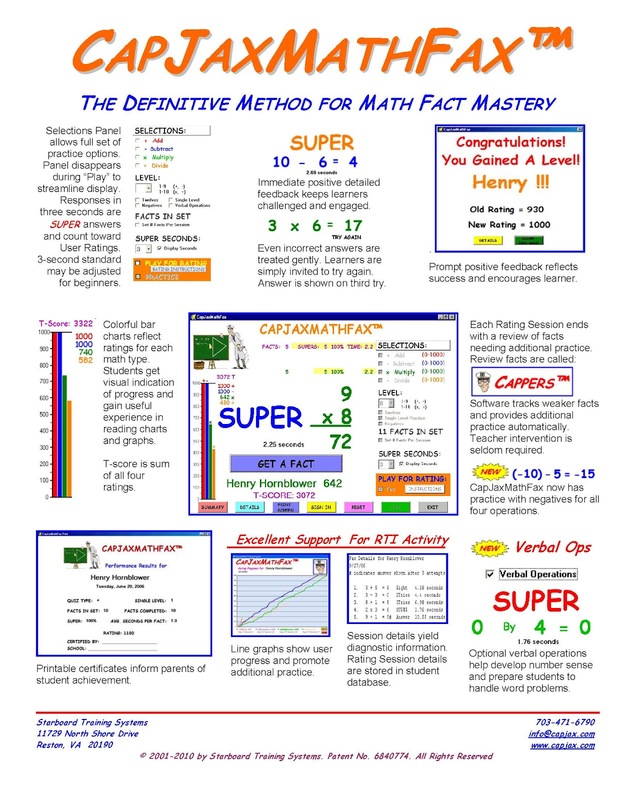 I signed up to use this program with my 4th grade daughter, to help her increase her times table recollection speed. I don't want her to just know her times tables. I would like for her to have instant recall of them. Turns out this is no simple task. 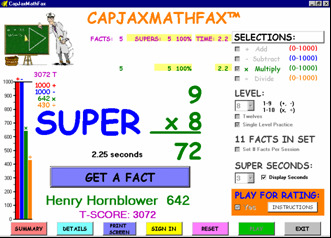 So speed drills and times table software such as CapJaxMathFax is such a blessing. 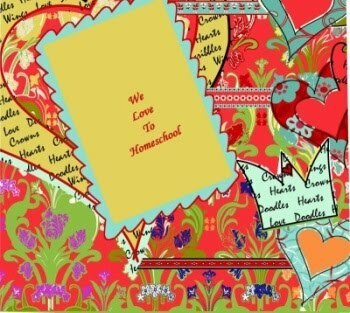 It helps take some of the monotony out of the task, versus ways such as flash cards and rote memorization. While these ways work fine, we prefer to use this sort of software. It took very little time for us to have the program downloaded, installed, and up-and-running. My daughter quickly had the hang of it. It is a program she can use on her own for regular drill practice. She has seen improvement just in the small amount of time that she has been using the program. Math isn't her favorite subject, so I won't say she loves using the program. But she doesn't mind too much and it is helping her speed of recall. The program drills addition, subtraction, division, and multiplication. When asked a question, your child has 3 chances to get the correct answer. If they still haven't entered the correct answer, then the answer will appear on the screen. Your child can copy the answer. Then your child can answer the correct answer once more without assistance. CapJaxMathFax has an optional "startup notes" that you can turn on or off. If on, the helpful tips will pop up on the left side of the screen at certain times. It is a helpful feature. You can choose to run in practice mode or to play for ratings. Your goal is to answer each question in 3 or less seconds. This is adjustable, and for beginners you can change the 3 seconds to give more time. CapJaxMathFax is simple to use and includes a progress graph, to visually see how your progress is going. Questions increase in difficulty as progress is made. I appreciate that the program allows you to try it out for free, so that you can decide if it is or is not a good fit for your child. Disclaimer: I received this product free of charge to review, as part of the TOS Homeschool Crew. The above is just my opinion. Please remember that opinions may, and do, vary.